Another show over, we're halfway through summer and time to be looking forward to our next production! 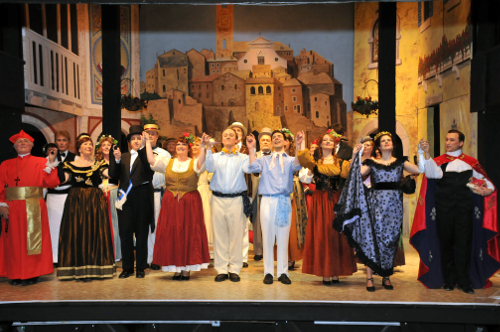 'The Gondoliers' was a huge success and well done to Patrick Monk and the production team for such a spectacle. Before we launch into the 'Yeomen' pre-audition sing throughs, we will be preparing for the concert at St Botolph's Church, Trunch on Saturday, 10 September at 7.30 pm. This will be a mixture of G & S favourites and musical hits, so something for everyone! We will be holding five rehearsals, starting on a Thursday, 11 August (venue tbc), Tuesdays, 16, 23 and 30 August and finally, Monday, 5 September. Thanks to Keith and Rachel for rallying the troops and putting the programme together and for Margaret as MD and Beverley, accompanist. We will be joined by Richard Mitchell, our director for next year, who will be singing one or two well loved numbers! The ENOSOC website: PLEASE NOTE With effect from the day after the AGM, access to the members page will require a username and password. These will be available at the AGM, if you are unable to attend the Secretary will be able to supply the information. Finally, we must mention the AGM which will take place on Tuesday, 6 September. We look forward to welcoming members and patrons to this meeting at Wroxham Church Hall, commencing at 7.30 pm. Enjoy the rest of the summer and we will see you soon! A successful show indeed from Patrtick Monk, who had played the tenor lead of Marco ten years earlier with ENOS and returned as director for this production. A strong line up of principals, a few with lead roles for the first time and giving impressive performances, were supported by a small but outstanding chorus. The quality and discipline of our chorus singing is the foundation of successful productions and what makes ENOS an outstanding society. Below are the reviews from NODA and from the EDP. Huge congratulations to all concerned. You cannot help but admire the fine set, all home painted and created, setting the Venetian scene, complete with moving gondolas, as the assembling crowd (Chorus take a bow), enter in anticipation portraying the ‘busy’ backdrop to a fascinating, if not the original and so often copied, ‘misplaced at birth’ tale with a twist. It is immediately clear just why I so look forward to my annual visit to ENOS and their particular enthusiasm for the G and S phenomenon. The whole cast are as one to create a story that may not be as gripping as some more modern operettas but which captivates their audiences with a belief in what they do and which transcends the roles of Principals and Chorus! The enjoyment for the audience is to see the obvious portrayal and individual joy of performance of each part however small. Of course there are significant roles well cast and some outstanding performances. I particularly heap praise upon the ‘Quartet’ around which much of the story is spun. The two Gondoleri (plural I gather!) as per the song...as ‘Kings’ in waiting, Marco Palmieri (Martin Milnes), once again gracing the stage with his undoubted talent and tremendous tenor voice and Guiseppi Palmieri (Thomas Monument) in no way daunted, showing equal style as together they sung in singularity with total synchronicity, and in the finale to Act1, with their equally strong, erstwhile possibly ‘temporary’ wives, Gianetta (Genevieve Plunkett) and Tessa (Teresa Clayton) providing some really outstanding musicality. Also good to see Jen Alexander as Luiz taking another leading role with ENOS and providing excellent vocals with undoubted ‘regal’ undertones complemented by his denied love Casilda (Rachel Goodchild); she played Gianetta for ENOS ten years ago, and has clearly taken the G and S ethos to heart showing great style and vocal prowess ! Some nicely defined chemistry from this pair displayed in their Act 1 duets...the ‘hidden’ portent of things to come! We relished the more mature partnership and yet more chemistry between The Duke and Duchess of Plaza-Toro with some particularly poignant advice for life and indeed humour in their songs ! The role of The Grand Inquisitor, Don Alhambra del Bolero, has to strike a particularly difficult and demanding balance between comedy and stern law enforcement, and can fall between two stools...here Keith Swetman got it just about right with some trade mark tongue twisting tricky patter singing and stylish delivery, including his personal ‘manicure’ tool and hip flask, his was a striking presence with his flame red costume adding gravitas to the role. Not too stern with some humorous asides...Ladies beware! There were any number of well portrayed smaller cameos from within the Chorus but I will single out Man about Town and Fashionable Gentleman, Antonio (Steve Holmes), he epitomised the extravagant mannerisms and style so necessary in a successful G and S Chorus; he put every ounce of his energy into entrances and songs providing a role model for any relative newcomer to this genre. Once again I emphasise the importance of the Chorus whose ensemble singing was a joy and not least their attention to MD Ros Swetman who clearly knew every word as well as they did as she led the excellent small orchestra with energetic aplomb! The costumes were colourful, well displayed and appropriate to the era. And of course, all’s well that ends well in this... ‘Case Unprecedented’! Another fine show that ENOS can be proud of... Same time next year! Those of you who have either enjoyed watching Martin Milnes on stage with ENOS, or had the pleasure of appearing in shows alongside him, will know that his professional career goes from strength to strength. Martin first appeared with ENOS as Hilarion in the 2012 production of Princess Ida – that was when we realised that he not only possessed a fine tenor voice but also a spectacular falsetto range. His rendition of 'Poor Wand'ring One' literally left us speechless! We were lucky enough to enjoy his talents last year in 'The Sorcerer' and again this year in 'The Gondoliers'. Too much happiness! Martin is the other half of a superb double act, Ferris and Milnes. Dominic Ferris is the pianist (and equally talented singer) but to call him the accompanist would be a huge injustice to his versatility and showmanship. Margaret, Sue Marler, Anne and myself travelled to the Theatre Royal, Drury Lane in October to enjoy Ferris and Milnes as part of the 'Hey! Old Friends' concert which celebrated Stephen Sondheim's 85th birthday. A star studded cast including Millicent Martin, Julia McKenzie, Lorna Dallas, Tim Flavin, and dozens more - but it was Ferris and Milnes who got a standing ovation for their rendition of 33 Sondheim songs in 5 minutes! Ferris and Milnes are regular performer at St James' Theatre Studio and Sue and I have had the pleasure of travelling to London to enjoy their extraordinary talents at St James'. The photo below shows them in full throttle in Trafalgar Square last month performing as part of the 'West End Live' event. It’s only a few weeks ago since ‘The Gondoliers’ gave its final performance at the Maddermarket but already we look forward to the next show, ‘The Yeomen of the Guard’. The most serious of the G & S operas, Yeomen doesn’t have one complicated baby swap plot, or a magic potion to its credit; however, it does have strong characters, an outstanding score, and fabulous chorus numbers. It also has a sad ending – although it is up to the audience to decide whether Jack Point, falling insensible at Elsie and Fairfax’s feet, has died of a broken heart or has simply collapsed. For this production, we need lots of chorus, especially men! Please pass the word around your friends, family, work colleagues et al and let’s raise the Maddermarket roof with an unforgettable double chorus! Talking of production, we are thrilled to be welcoming professional singer Richard Mitchell as our director. Richard is Norwich born and his singing career saw him perform with D’Oyly Carte, English National Opera and Opera Australia. Having retired to the Norfolk coast, we are delighted that Richard has seen our last two productions and contacted us expressing an interest in directing ENOS! He and Chairman Margaret Collingwood recently appeared on Radio Norfolk to promote the forthcoming show and his sense of fun and enthusiasm for G & S was very evident! You can read more about Richard in the following article which he kindly passed to us. Margaret will be choreographer, while I will be taking chorus rehearsals until Christmas and multi talented Richard will conduct the band during show week. Incidentally, please note the date of auditions: Sunday, 2 October from 2 pm at Wroxham Church Hall. The audition pieces, music and lib, are now available on the website.You may also view the last two ENOS productions of 'Yeomen' which are available on the website! Born in Thorpe St. Andrew, Richard studied piano from the age of eight and took up the French horn at the age of fourteen, mainly because the school had a spare horn and no one to play it in the school orchestra! Having always enjoyed singing, he joined the Norfolk Opera Players whilst still at the Norwich School and in 1968 played Mercury in ’Orpheus in the Underworld’ at the Theatre Royal and Spiridione in ‘The Night Bell’ at the Maddermarket. He originally trained as a music teacher in Colchester with a final year in London where he remembers queuing daily for the Proms and running up several flights of stairs at the Coliseum to the cheap seats in the Balcony to see the English National Opera, little dreaming that one day he would be there, on the other side of the curtain! He subsequently taught in the East End of London for three years forming a student opera group performing such works as ‘Trial by Jury‘ and ‘The Pirates of Penzance‘. He says he is sad that so many schools these days have abandoned Gilbert & Sullivan for the much more ‘sophisticated’ musicals. He adds , “there is a huge snobbishness about G & S but it requires a very specific discipline that is lacking today, even in the professional world”. As a regular reader of ‘The Stage’ newspaper he noticed that the D’Oyly Carte were auditioning for new members so he went along to The Savoy Theatre and sang for them. He has no idea why he remembers this particular fact, but it was a Wednesday and it was that fearsomely hot summer of 1976! He remained with the D’Oyly Carte for three year understudying one of their true stalwarts, Ken Sandford and played in Norwich regularly. He says “I learned so much from all those great artists particularly their leading comedian, John Reed. In 1990 came a call from ENO to join the chorus, a job which was to last for the next sixteen years. It was thrilling to be part of that prestigious company performing on that huge stage and working with many of the singers I remember seeing in my student days. I appeared in over ninety different productions with them playing small roles and understudying larger roles. Being with the ENO gave me my one and only chance to sing at the Proms where I sang the role of the ADC to Napoleon in Prokofiev’s mammoth ‘War and Peace’. To celebrate thirty years in the theatre he persuaded the ENO to give him a one year sabbatical which he started off by visiting Sydney. Eight years later, he was still there! He had joined Opera Australia and, again understudied principal roles, remembering fondly the night he had to play two different roles in Verdi’s ‘La Forza del Destino‘ on the same night, fortunately not getting them muddled up! 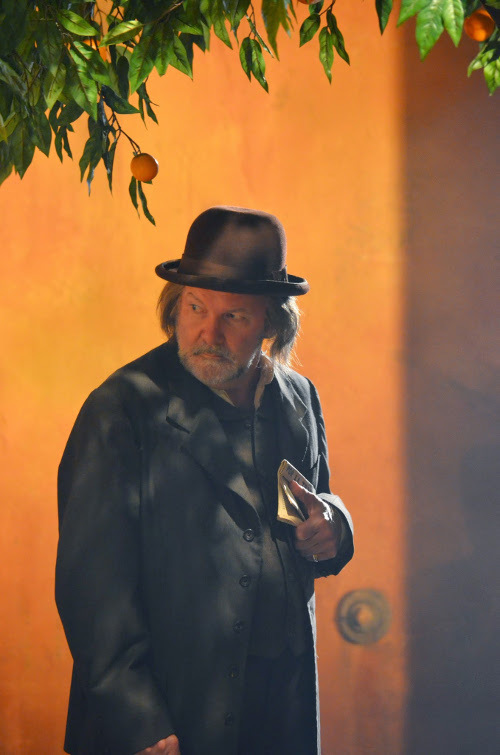 He made his final appearance with Opera Australia as Sciarrone in ‘Tosca ‘ on stage at the Sydney Opera House in 2014. Returning to Norfolk to retire, his theatrical life has taken a new turn as he is to both conduct and direct ‘The Yeomen of the Guard‘ with the East Norfolk Operatic Society at the Maddermarket next May. He says he is enormously honoured to be asked and though it appears a daunting task he is confident that this excellently organised local company will help smooth the path to a great show. He says, “I feel as if I have come full circle and that now it’s time to pass the mantel on to a whole new generation of performers“.